The New Quasar Is The Old Quasar, But New! For the last few years Marvel Comics has had a strange separation of church and state, with the regular superheros and the cosmic superheros not really interacting that much. While high profile crossovers like Civil War, Dark Reign and Secret Invasion have been getting tons of attention from fans and media, solid cosmic epics like Annihilation, War of Kings, and the upcoming Realm of Kings don't ring a bell to many. While these crossovers and titles haven't been burning up the charts, they also haven't been complete slouches. Still, they could use a bigger readership and Marvel is hoping they'll get that by bringing back Quasar. 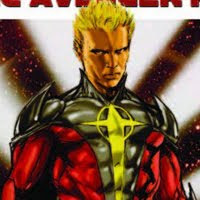 Oddly enough, this new Quasar seems to be the old Quasar, Wendell Vaughn, and if that is the case, it may be just enough to drum up some new interest in the cosmic side of Marvel Comics. 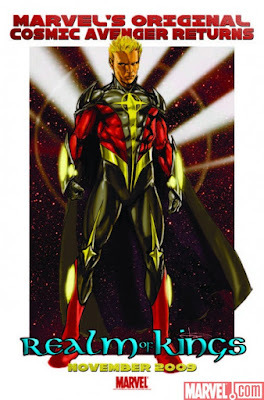 Check out the full new costume of Quasar below, as he will appear in Realm of Kings this November.